In the US, when it comes to bike trails and bridges, they go together like bread and butter, for there are numerous examples of trails in the country where one important bridge is included. There are Rails to Trails where former rail lines are converted into bike trails and include many iron and steel bridges in the process, like the Katy Trail, which connects St. Charles and Booneville in Missouri or the Cowboy Trail in northern Nebraska. There are those, like the Wabash-Erie Canal Trail near Delphi in Indiana, where historic bridges are used as crossings- many of which are imported from other locations that are desolate and whose roads are no longer used, so that they have a new lease in life, like it was the case with the Gilmore Bridge, one of two Stearns through truss bridges left in the country. And there are cases where either mail order bridges consisting of welded steel bridges are brought in to serve as crossings either because they were affordable or in some cases they replaced the historic bridges that were either deemed unsafe and had to be removed or collapsed because of disaster. The Horn’s Ferry Bridge in Marion County, Iowa (which a later article will explain about its history) is an example of such a case. When cycling in Copenhagen, bridges and cycles go together like bread and butter but in a different fashion. As mentioned in the Flensburg Files article on Copenhagenization (please refer to the article by clicking here), Copenhagenization refers to the establishment of bike trail networks in a city at the expense of the automobile in an attempt to reduce carbon dioxide emissions, which has contributed a great deal to global warming. This concept consists of including bike lanes on every main street- a concept known as sharing the road, as well as establishing bike routes going through green areas and parts of the city where one cannot reach by car. 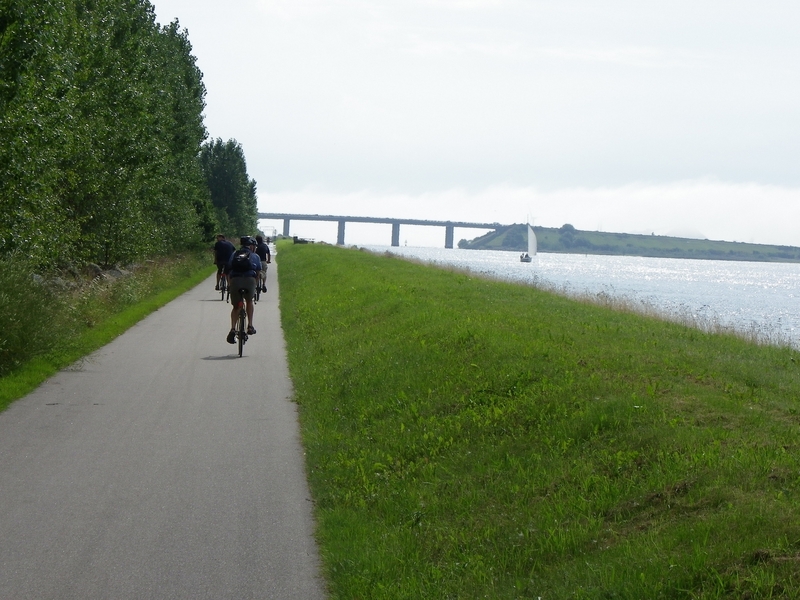 Ever since the 1950s when the concept was first developed, one will find bike routes virtually everywhere in the city, and more are being established to accommodate more bikers who seem to embrace the concept of commuting on a regular basis as a way of life in Copenhagen. 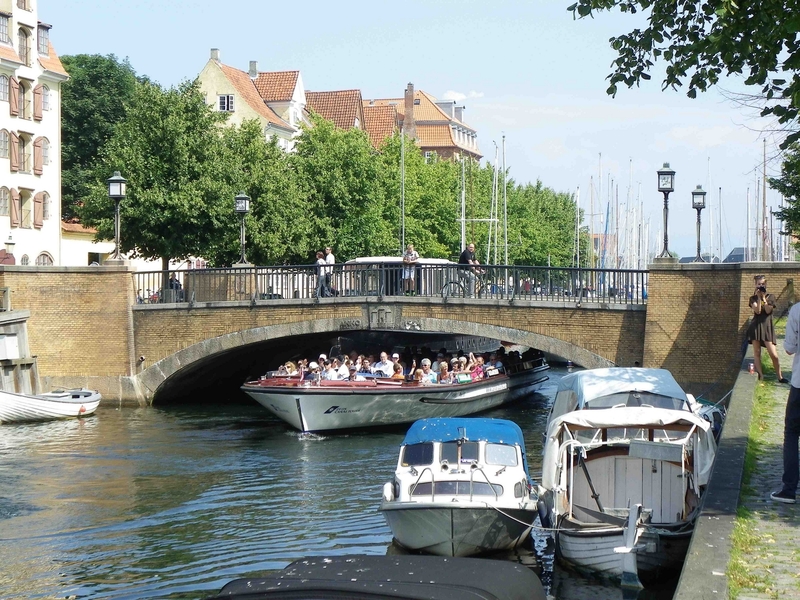 With Copenhagenization come the bridges that serve the canals and other deep ravines in and around the city. Of the four dozen or so bridges that serve the city and the region of Kastrup), all but a couple bridges are biker friendly- meaning space is made to accommodate those pedaling those two-wheelers, whose history and success dates back to the 1780s when the first bike (a walk-a bike because there were no pedals on it) was invented. In a couple cases, individual bridges were built just for bikes alone to make the trip through Copenhagen as hassle-free as possible. It is no surprise that city planners plan their bridges to serve two key purposes: functionality and conforming to the city aesthetically. In Copenhagen (and in general, Denmark), the bridge landscape consists mainly of bascule bridges and as well as various forms of deck arches, regardless of the materials used for constructing them (some were built using brick while the rest were made of steel). One will rarely see a truss bridge in site. In fact, one can see a Town Lattice pony truss bridge spanning a lake at Norreport Park on the north end of the city center. The majority of the structures were completed in the 1930s and 40s, even though there are some exceptions to the rule- these will be presented below. 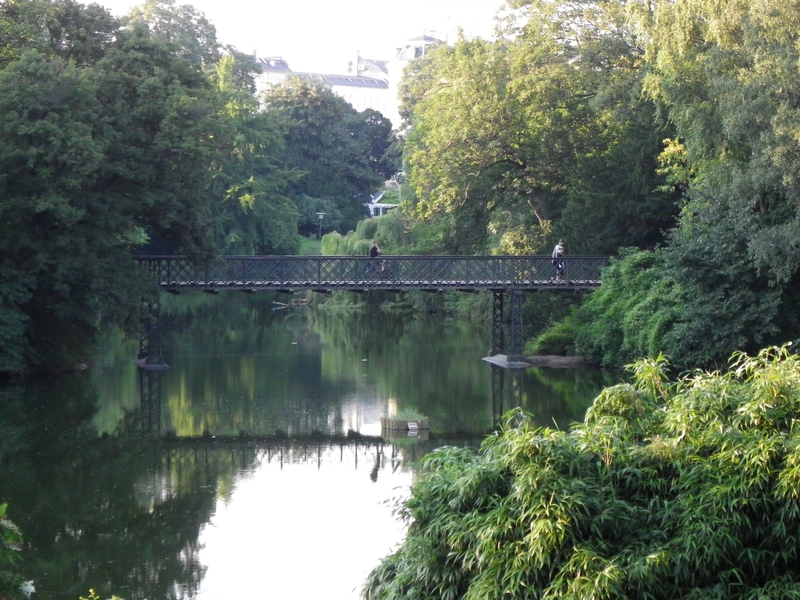 However, recent developments have indicated that with the increase of cyclists roaming the streets of Copenhagen, the need for bridges to cross the bodies of water surrounding Copenhagen and the ravines consisting of small valleys- some filled with rail lines entering the city from the west and south. 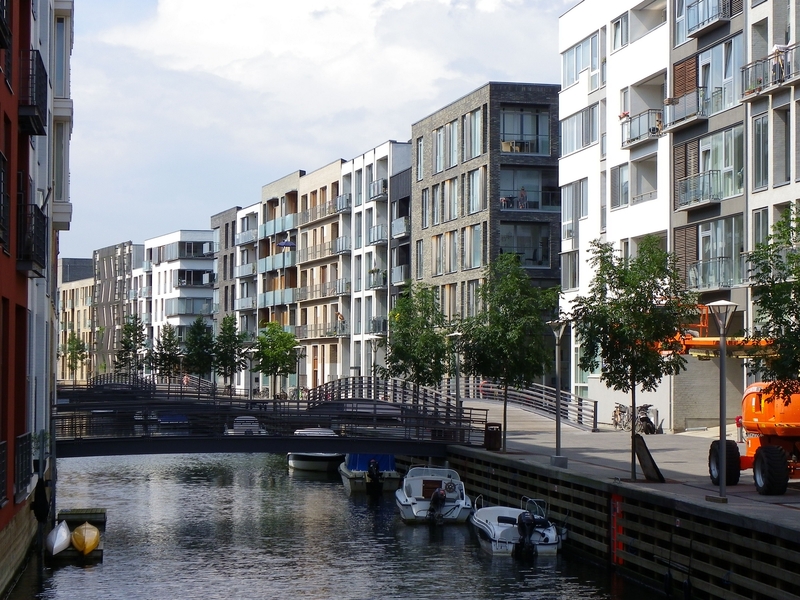 In the past decade alone, as many as a dozen bridges have been built in Copenhagen, most of them located in the southern and eastern ends of the city in places like Christiania, Ørestad, and Kastrup, where much of the area has been developed along the water front. 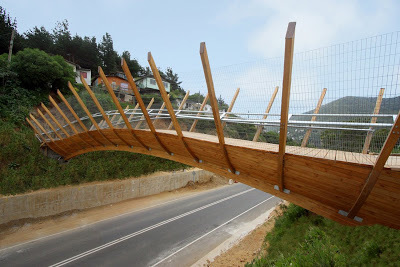 While the main purpose of these new bridges still is to function as a means of transporting people from point A to point B, many bridge engineers have come up with fashionable ways to make the structures appealing to those who either cross or go past them. While many pontists would consider these bridges too modern and bland for their taste, others have embraced them as a symbol of the city and its pride in encouraging people to use the bike instead of the car to get around. 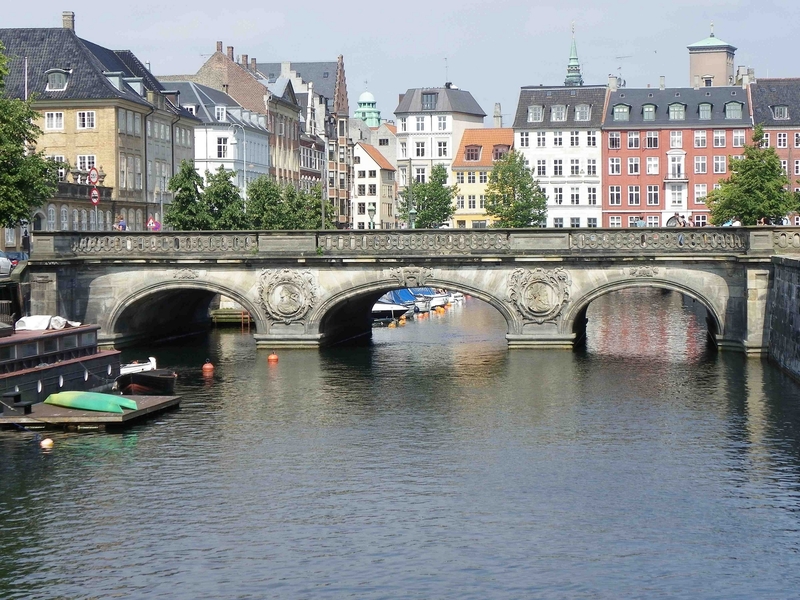 To please both parties, I have chosen five of the best historic bridges and five of the must see bridges that are part of the Copenhagenization process. Each one will feature a brief summary as well as a photo to provide a tourist with a chance to see them from the eyes of the bridge photographer and perhaps plan a visit to them while in Copenhagen. Please note that the Øresund Bridge is not included in this article for a separate article will be presented on this structure at a later time. For each category, there will be two that will be mentioned honorably with a couple remarks about them. Description: One-span closed spandrel brick arch bridge with ornamental railings. Bridgehunter’s comments: While the inscriptions on the concrete railings indicated that the bridge was constructed in 1650, literary sources pointed the date of 1681 as the time of its construction. 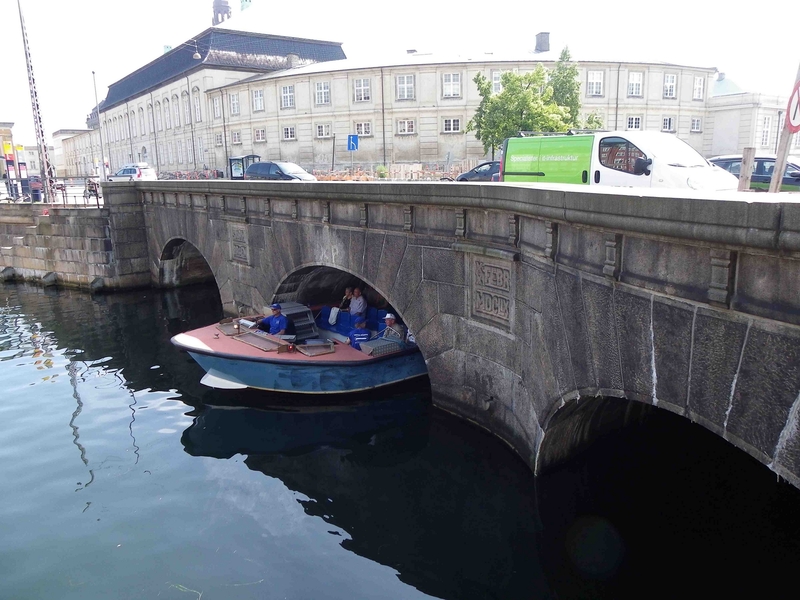 Nevertheless, the bridge is perhaps the oldest bridge left in Copenhagen that is still in service. 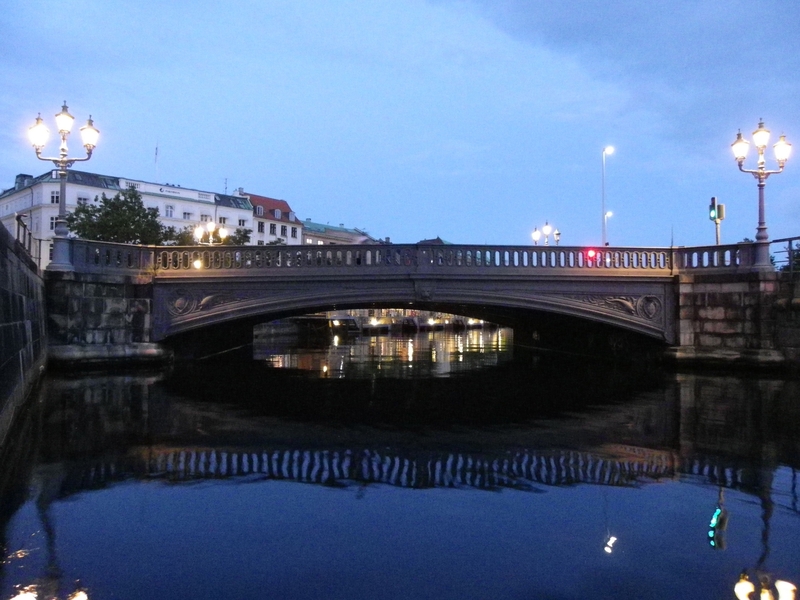 The bridge was the main show for the Swedish Army’s attack on the people of Copenhagen in 1659. Despite gaining ground on the city, the Danish eventually gained the upper hand and drove the Swedes back over the straight, leaving 2000 dead in the process. Today, this bridge still serves traffic but in a small neighborhood east of the city center. While it may be a forgotten bridge to many, this structure still holds a lot of history for those who know about it, even when talking about it over a cup of cappuccino at the cafés located nearby or passing through it by boat. Bridgehunter’s comments: The Højbro is the most ornamental of the bridges serving the inner city of Copenhagen. With its lion head serving as the keystone (center point of the main span) and its colors of gold and grey, the bridge is largely noticeable by those either passing under it by boat or past or even over it by foot or by bike. This the last of the works of Vilhelm Dahlerup, who was a prominent bridge builder in Denmark and given the recent renovation and its ability to handle multiple traffic, this bridge will remain over the canal for years to come. Built: 1954 (present structure) replacing a temporary bridge built in 1930 to replace a 1903 swing bridge. Origin of the structure dates back to 1886. 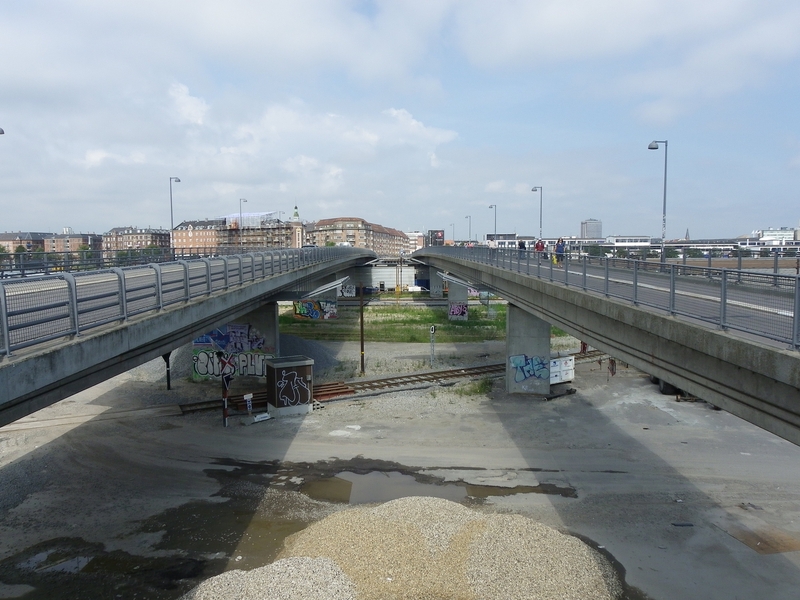 Bridgehunter’s Remarks: The Langebro is perhaps the most popular of Copenhagen’s bridges per say, as it was featured in many fine arts pieces. It was a play written by Hans Christian Andersen, who was also famous for Mother Goose and other famous children’s stories. It was a scene of an attack by a reptile-like monster in a film made in 1961 entitled Reptilicus and the bridge was left in ruins as a result. And because the original bridge was relocated from London to Lake Havasu City, Arizona in 1969, the Langebro was featured as the replacement of the London Bridge in the 1971 film Geordie (the setting was also shifted to Copenhagen instead of London). From the point of view of an architect, the bridge is the largest in Copenhagen and is one that is a must see, not only in terms of its functionality as a bascule bridge, but also in terms of its appearance with its red brick arch spans and the artwork featured along the canal next to the bridge. While it is probably inappropriate to use this bridge as an imitation of the London Bridge in Georgia, one can tell that this bridge still looks like it was built five years ago instead of almost 60 years ago and will most likely stay in service for a very long time, with a little bit of maintenance work. 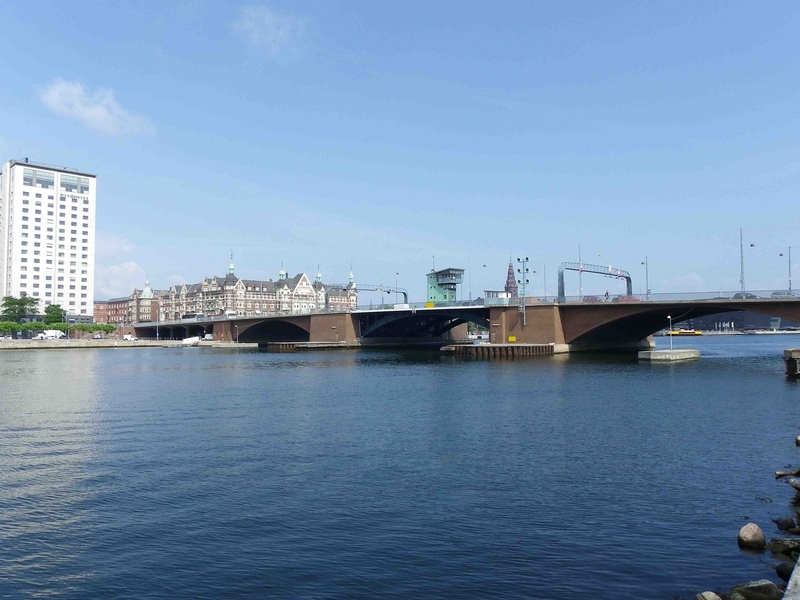 Bridgehunter’s Remarks: The Knippelsbro is the shorter of the two vehicular bridges spanning the Inner Harbor but is the shorter and most unique in comparison to its counterpart, the Langebro. While the bascule span looks similar to the Tower Bridge in London in terms of design and function (the two half spans open in opposite directions to allow ships to pass through), the north approach span is unique as the roadway is supported by steel cylindrical columns, which serves as hydraulic support as it lowers with the weight of traffic, making the roadway move vertically; especially when the bascule span lifts to allow ships to pass through. This is extremely rare for a bridge, even though engineers are either building or even retrofitting many of the bridges to avoid the risk of collapse due to weight or even natural occurrences, such as an earthquake. Veering away from the technical aspects of this bridge, the bridge dates as far back as nearly 400 years, when it was first known as the Great Amager Bridge, but had its name changed two additional times until the city settled for Knippelsbro, named after Hans Knip, who became caretaker of the bridge in 1641, collecting tolls from passersby and maintaining the structure’s upkeep. His house was located nearby and was named Knippenshus and the bridge was named Knippensbro, although it is unknown when and even more so why the people of Copenhagen embraced the official name of Knippelsbro. Description: Two-span closed spandrel arch bridge constructed of sandstone. Bridgehunter’s Comments: The Marble Bridge is situated at the gate to the Danish palace and given its age and ornamentation that can be seen from the neighboring bridges, it definitely deserves its place in the royalty. The bridge is perhaps the second most ornamental bridge that can be found in the city and one that is a must see if you are by bike or by foot. 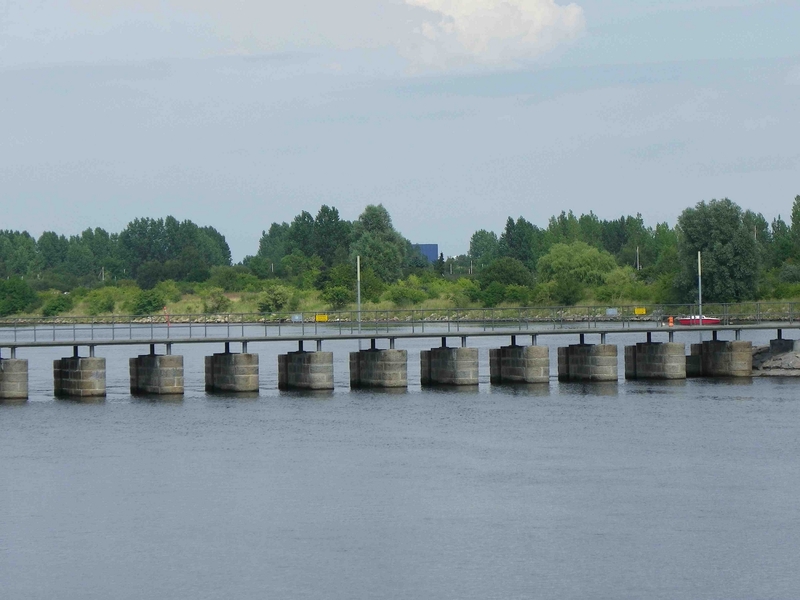 It can be seen from the bridges located on both sides of the structure. However, given its wear and tear on the roadway (despite its cobblestone roadway, it is a rather bumpy ride across the structure) and black appearance on the ornamental designs, it would not be surprising if this bridge receives a cleansing so that it lasts another 350 years. Nevertheless, the bridge deserves to be in the top 5 because of its history and aesthetic appearance and how it conforms to the cityscape Copenhagen offers. Holmens Bro: Built in 1954, this single span closed spandrel arch bridge was constructed out of granite. Yet it was built to replace the bridge that was designed by Dahlerup and built in 1878. Given the fact that the present structure compromised the historic value of its predecessor and its age, it fell into this category, even though the bridge is worth mentioning and a few photos. St. Anna’s Bridge: Spanning one of the canals going through Christiania, this bridge is one of the most forgotten of Copenhagen’s bridges, as it was first built in 1781 and redone again in 1883 and 1924. The brick arch design with some ornamentation on the railings is a real eye-catcher to the pontist and the age of the bridge and its setting makes a person feel like walking into Copenhagen’s past- say 200 years ago or so. Christian IV’s Bro: Built in the early 1920s, this bridge is located to the south of Marble Bridge over the Frederiksholm Canal and represents an example of a steel stringer bridge built before the war. Many of these types were built throughout Denmark during the 1920s to replace the ageing wooden spans. This one had a predecessor as it was built using piers from either an iron or wooden bridge. The bridge was named after King Christian IV, who ruled Denmark from 1588 until his death in 1648. Sorterendebroen Arch Bridge: Spanning the strait connecting Sydhavn and the channel leading to the Baltic Sea, this bridge is the longest fixed structure of its kind in Copenhagen and it definitely belongs to the top 10 of the longest spans (vehicular and non-vehicular) in the city. Its closed-spandrel concrete arch design can be seen from the railroad viaduct which carries the Øresundline to the airport and eventually across the Øresund-Strait to Sweden. The road that the bridge carries runs parallel and serves as a link to the suburbs surrounding the airport. While it is unknown when the bridge was actually built, judging by its structural condition, the bridge is probably at least 50 years old. Nevertheless, it has been serving its purpose for a long time. Kalvebobbroen Viaduct: This is the second longest bridge in Copenhagen, behind the Øresund-Bridge, with a length of 8 km. The bridge was completed in 1987 and serves the E20 motorway, which tangents its way along the Baltic Sea Coast connecting the Kastrup region (and the airport) and the southern suburbs of Copenhagen. The bridge represents a classic example of how Danish civil engineers love to build bridges that are tall and long. After all, they need to connect one island to another. Description: Using traditional bridge type standards, the west half is cantilever deck and the east half is a beam span built on piers. Built completely of steel. Bridgehunter’s Remarks: For an innovative bridge engineer there is always a first when it comes to designing fancy bridges. This one was a first: a rather fancy design that fits with the modern landscape; especially in the area where it has been recently developed for accommodation and business purposes with lucid architecture- breaking the traditional designs that many architects prefer. 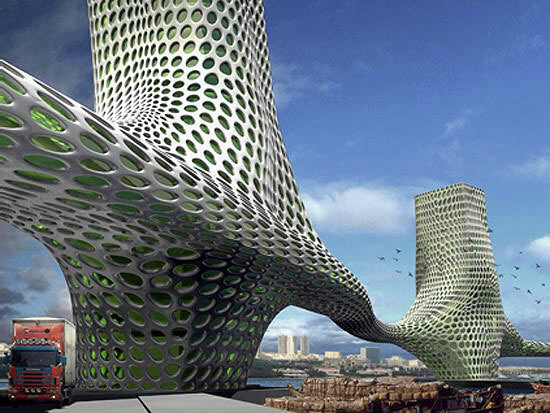 Yet like the buildings that are using renewable energy resources and are supposed to be carbon neutral, the bridge has a unique functionality which one cannot really expect from a non-vehicular bridge. The bridge is segregated where one lane is explicitly made for cyclist, the other for pedestrians only. 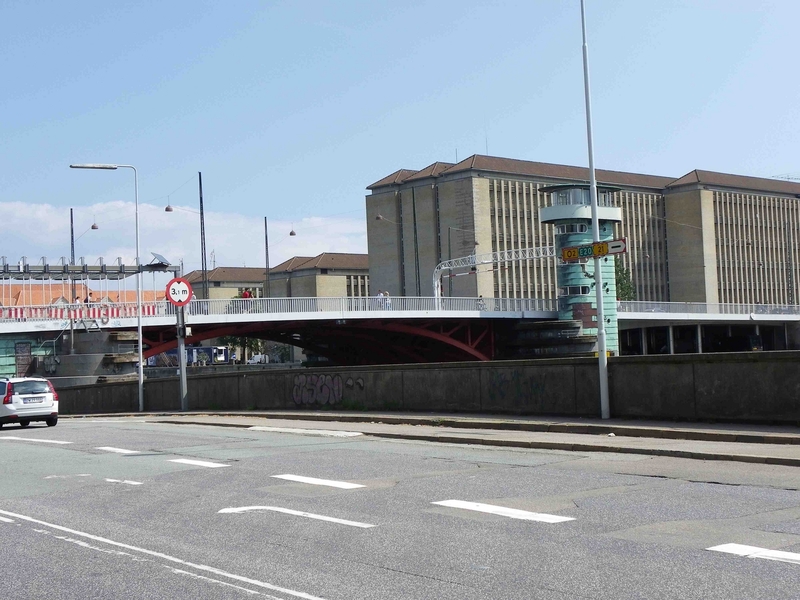 This was designed for safety purposes so that the cyclists can cross the bridge with no delays while avoiding accidents involving pedestrians at the same time. It is unimaginable seeing such a bridge serve that purpose in the US and other places where a bridge is used for everyone including pedestrians and cyclists, but given the increased usage of bicycles and the expansion of bike trails especially in cities with more than 20,000 inhabitants, a plan for a bridge like this one may be in the cards 10 years down the road. If one counts Sydhavn as part of Copenhagen’s Inner Harbor, then this bridge was the first one built in 52 years (the Langenbro was the last bridge built in 1954), but given the increase in the number of bikes in Copenhagen, this bridge will soon have company as other bridges are in the drafting phase waiting to be erected over the next 5-10 years. Description: Consists of two viaducts- both built of concrete and steel. One is used exclusively for automobiles and buses, the other for pedestrians and cyclists Both are 240 meters long. Bridgehunter’s Remarks: Located not far from the Bryggebroen Bike Bridge at the north entrance to Copenhagen’s largest shopping center, this viaduct provides both the motorists as well as the cyclists with easy access to Copenhagen’s train station, which is about 5-10 minutes away pending on what form of transportation you use. Normally, one will find only one bridge whose outer lanes are reserved explicitly for cyclist and pedestrians. To a certain degree, one could imagine a historic bridge (be it arch or truss) being used exclusively for pedestrians while the modernized bridge serves vehicular traffic only. This modern but unique bridge is one of the rarest forms to be seen in Copenhagen not only because of its function but the fact that the viaduct is almost 1 km long and spans railways in a ravine that is approximately 20 meters deep. This duo viaduct is located at the north end of the Fisketorvet Shopping Center, the largest mall in the Danish capital. Description: This bridge is best compared to a glass which is filled with a third of each liquid, starting with the heaviest and ending with the lightest- like honey, jello and a fruit drink for example- and not being able to mix them together. From a bird’s eye view, it looks like a cable-stayed bridge whose thick cables are supported by only one steel tower. Seeing it up close and judging it by its side and oblique views, looks like a kingpost truss bridge with riveted connections. If that was the case, then it would be the rarest bridge in the world for the bridge type has long since been out of use, and in addition to that, most kingpost truss bridges built in the US and other places in the world consisted of pinned connections. There are only a few examples of those built using riveted connections today, like the Schoenemann Park Bridge in Luverne, Minnesota and the Waddell Kingpost through truss bridge located at English Landing Park in Parkville near Kansas City. Looking at it more closely and one will find by the appearance of hydraulics on the diagonal components, that this bridge is a drawbridge, spanning a section of Copenhagen’s west harbor and accommodating traffic in the newly developed region located just to the north and west of Ørestad. Description: To the taste of many bridge fans, this structure does not deserve to be recognized, as it is very original and bland in color. However, one must not judge a book by its cover when it comes to this steel beam bridge. Resembling a footbridge, this structure was built using the least amount of steel possible, making a person wonder how the bridge can survive extreme weather conditions, as well as numerous residents of Ørestad using it to get to the harbor from their houses. The bridge is also difficult to access as it is blocked off on the east side and access from the western edge is difficult, forcing the person to believe that the bridge is privately owned, which it probably is. By the same token however, one can get a good side view from its neighboring bridge, the Spaellandsbroen Bridge, which runs parallel to the railway and carries traffic to Kastrup. The Bridges of Frederiksholm– Known as the Danish version of Little Venice, these are a network of steel and wooden bridges connecting the apartments that exist- all over a body of water belonging to Sydhavn. 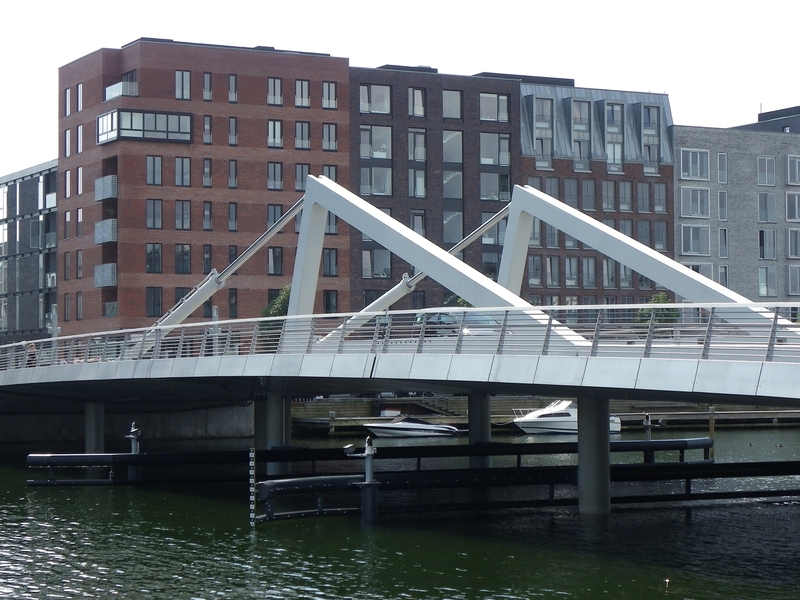 While they may look bland to bridge enthusiasts, the bridges serve both pedestrians and vehicular traffic that drive in and out of one of the newest residential districts in Copenhagen- in existence since 2005. Nørreport Park Pedestrian Bridge– located at the center of the largest park in Copenhagen’s city center (located next to the train/metro station bearing the same name as the park itself), this bridge has a Town Lattice design built on steel towers and spans the center part of the lake. It is rare to see truss bridges in Denmark but even more so in Copenhagen itself as the city has at the most about 3-4 bridges of this kind overall, with the landscape consisting of beam, arch and bascule bridges. For those loving truss bridges, this 1800 structure is a beauty that is a must see while in Copenhagen. The pedestrian/ bike trail bridge is well-maintained and serves as one of the main attractions of the park. 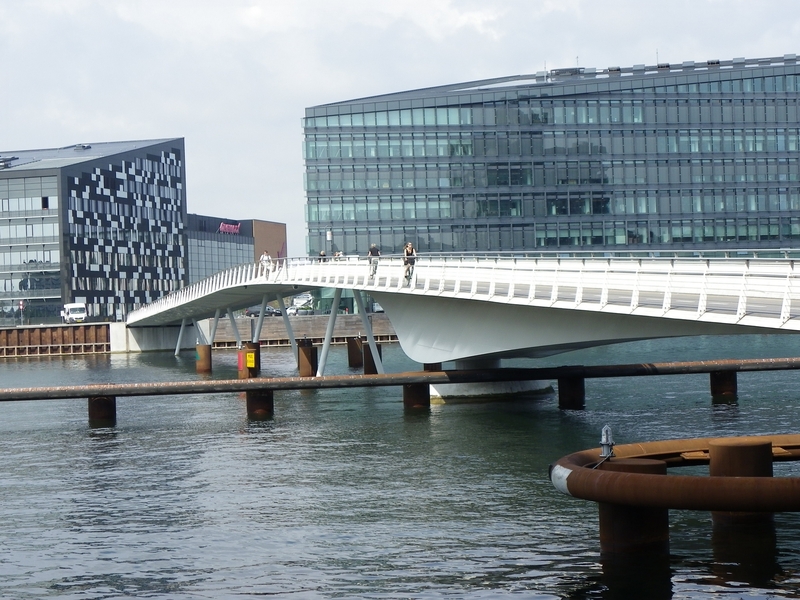 Of the above-mentioned bridges presented here that people should see while in Copenhagen, there is one structure that stands out alone and has become the new symbol of the city and region. Construction lasted 9 years and despite the high costs, the bridge brought the city (and the country) and its next door neighbor together. In the next article on the Bridges of Copenhagen, we will look at the Øresund-Bridge. Author’s Note: Please click on the flickr website for more pictures of Copenhagen’s bridges, here.